for someone with) any type of health condition that causes chronic pain, such as Fibromyalgia, Back Problems, Arthritis, Lupus. The program focuses on self-care, learning new strategies for managing pain, and gentle exercises to help manage pain. Group meets for 2 1/2 hours once a week. The program will be held at the Lost Creek Community Center in Marquette, Wednesdays, starting January 9th from 6:00 p.m. until 8:30 p.m. There is no cost to attend. Registration is required, as space is limited. Register by calling (906) 786-4701, dial 2-1-1 or register online at www.upcap.org/events. 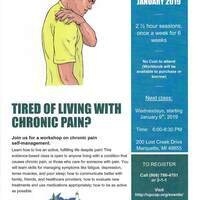 Chronic Pain Workshop is a good idea for all of the readers, I am sure that people will like this blog because of the new https://www.australian-writings.org/ sites which are presented here. All the readers will enjoy the reading of this blog.